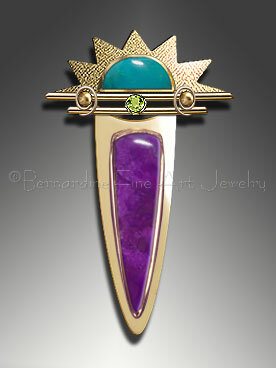 Bernardine Fine Art Jewelry has the best in quality handcrafted pieces. Each piece is unique and you can order specific customized jewelry designs in bracelets, rings, earring or necklaces from the artist. Exquisite cabochon rings, pendants, earrings and rings are beautifully detailed, along with a large array of men’s handcrafted fine jewelry as well. This is truly your one stop shopping for all the loved ones on your gift list throughout the year. Bernardine’s has an excellent selection of high quality birthstone jewelry, crafted into rings, necklaces, bracelets or earrings. Every birthstone is available in many different varieties and can be customized into one of a kind jewelry designs just for you. 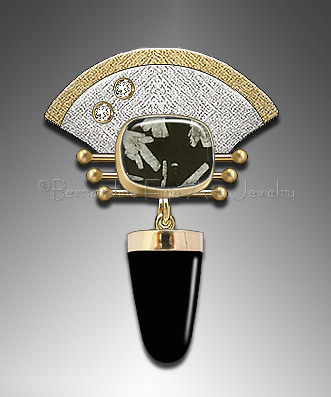 The artist here at Bernardine’s has a true passion for the intricate pieces which are finely designed here. Semi-precious and precious gemstones which are of finest qualities as well as silver and gold are all used in the creation of the one of kind jewelry designs. These pieces of fine art are both eclectic and classical at the same time. Each design piece is completely made by artist hands from start to finish with much care and love put into each and every piece. 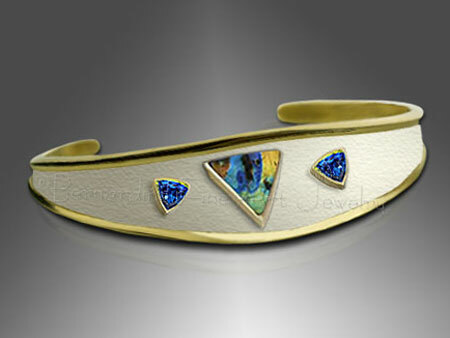 The designs in bracelets are detailed very fine and of the best quality artistry around. One of the most unique designs of these is fashioned with the use of hammered sterling silver, Montana agate, onyx, palm wood, dinosaur bone and ammonite, each stone is inlaid and carefully crafted in the hammered silver each having a unique design to them and added to form a beautiful bracelet. The use of theses stones which are rare make these pieces even more unique to own. Another personal favorite is a bracelet crafted with remarkable beauty out of Sugilite, Lapis, and Turquoise, chrysocolla and charoite stones. The color combinations are noticeably unique and a rare find upon the jewelry market today. These designs show true artistic vision by the crafts these unique pieces. Bernardine’s has lovely handcrafted chains in 14K gold, 18K gold and sterling silver. 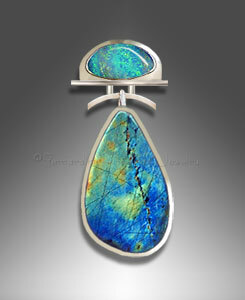 These can also be crafted using mixed metals if desired. Earrings, necklaces, rings and bracelets can all be made of these. If you want any type of stones added to these designs all you have to do is let the artist know when ordering. All of the fine art jewelry pieces at Bernardine come with care and cleaning instructions to keep your jewelry sparkling and looking new for many, many years to come. You can also contact the artist for a one of a kind design you may have in mind. These pieces are even more beautiful and remarkable once you see them in person with your own eyes. With such a vast selection of designs and gemstones available your imagination can run wild and the artist here will be glad to accommodate you with that. If you have a special wedding anniversary coming up, you can check to see what stones or jewelry types may be in fashion for this certain one. You can have an incredibly unique set of jewelry designed using the stones and metals you desire for a loving and thoughtful anniversary gift for your loved one. This gift will be treasured and loved throughout all of your years together.